This large tree is directly between Neely Auditorium and Rand/Sarratt, near the corner of the Rand terrace. Elms can be recognized by their lopsided leaf bases and double-toothed margins. The surfaces of American elm leaves are somewhat rough, but not as sandpaper-like as the very common slippery elm (Ulmus rubra). Large elms have a very distinctive shape with upward-sweeping branches. American elm is one of the earliest blooming trees and in late spring, the ground below the trees is littered with many of the round, tiny, winged fruits. In the south-central U.S., another species, September elm (Ulmus serotina) is virtually indistinguishable from American elm except by the fact that September elm blooms in the fall rather than the spring. American elm was once one of the most common trees found along streets in cities in the eastern U.S. Now the Dutch elm disease has wiped out many of these large, beautiful trees. 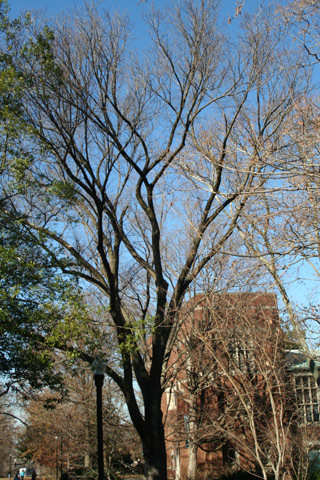 Vanderbilt campus has an unusual number of large American elm trees. The disease is spread by bark beetles which feed in dead branches. By meticulously trimming all dead wood off of the American elms on campus, most of the large trees have been spared the disease. This organism is a living specimen that is part of the  Vanderbilt University Arboretum  with the local identifier 2-674.